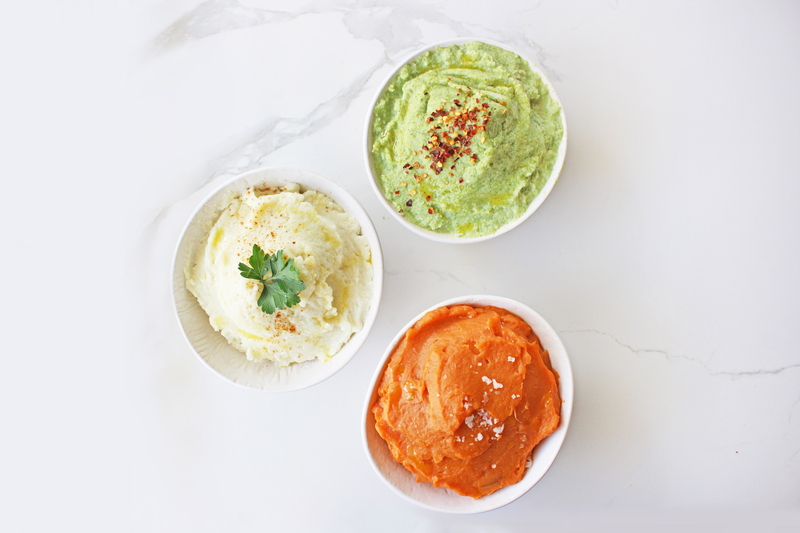 4 Healthy Holiday Recipes That Are Perfect For Your Next Gathering! The holiday season is in full swing, and it can be hard to stay healthy with all the tempting goodies around. 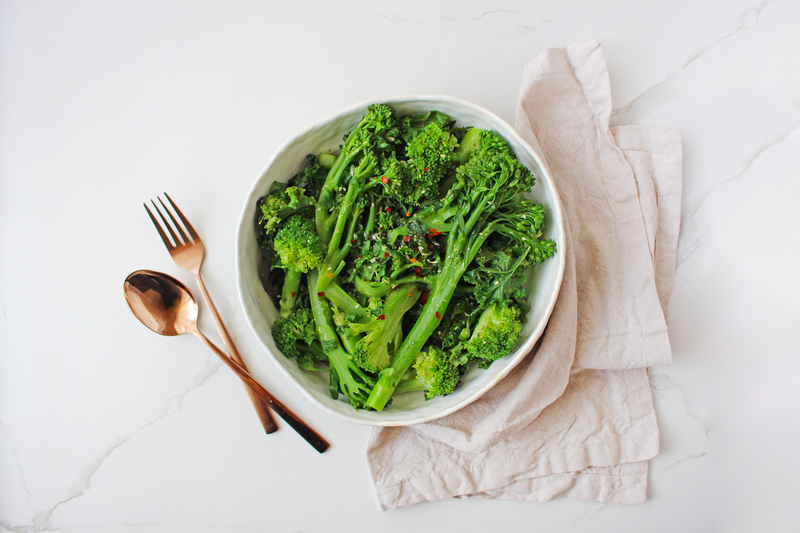 Jessica Sepel, clinical nutritionist, best-selling author, and founder of JSHealth, shares some delicious and healthy recipes for your holiday table. Heat 1 Tbsp olive oil in a large frying pan over medium heat. Add the garlic and cook until softened and golden. Add the greens and continue to sauté until tender. Add the chili and remaining oil and season to taste with salt and pepper. Preheat the oven to 180°C or 350°F. Line a baking tray with baking paper. To steam the vegetables, add 2 inches of water to a saucepan and place a steamer basket with a lid on top. Place the saucepan over a medium high heat and allow the water to boil. Once boiling, add the pumpkin to the steamer basket, cover with a lid and steam for 5 minutes. Remove the lid and add in the cauliflower florets. Cover and steam for 10 minutes or until the vegetables are cooked through. Remove from the heat and allow to cool. Once cooled, blend the vegetables together in a food processor or blender until smooth. Add in the nutritional yeast flakes or parmesan cheese, season to taste and blend again. 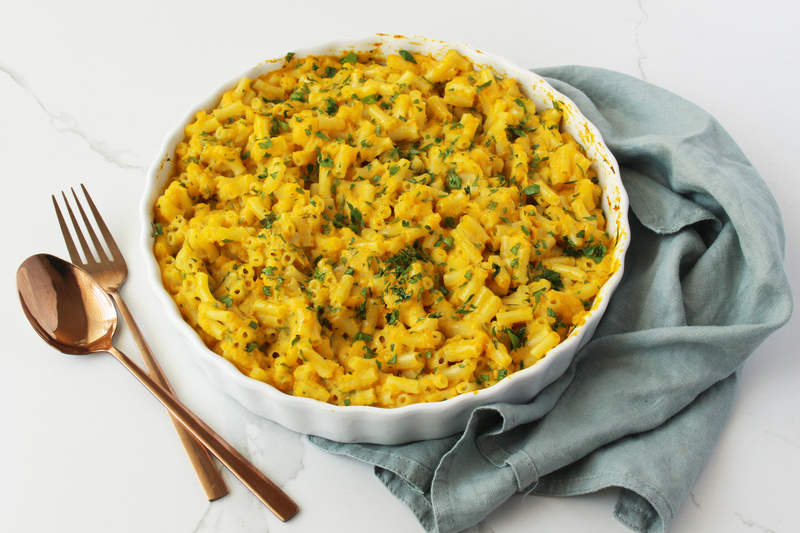 In a large mixing bowl, combine the vegetable mix, chopped parsley and cooked pasta. Stir well to evenly coat the pasta. Pour the mixture into a baking dish and bake for 15 minutes or until golden on top. Gluten-free pasta, mung bean pasta, pulse pasta, quinoa pasta, brown rice pasta or black bean pasta. If you tolerate gluten, wholemeal and spelt pasta varieties are also good options. Cut your vegetable of choice into large chunks or florets. In a pot of boiling water or a steamer, steam the vegetable until it’s very well cooked. For broccoli and cauliflower, this is approximately 8–15 minutes and for sweet potato, it’s 25–30 minutes. Allow it to cool slightly. In a food processor, add the vegetable of choice, milk of choice, coconut oil or butter, and walnuts. Pulse or purée the mixture until it forms a smooth, creamy consistency. Alternatively, you can use a stick blender until smooth. If it’s too thick, add a little water. Season with salt, pepper and paprika. If you don’t have the cookware to steam your veggies, you can add them to a large pot of boiling water and boil them until soft. Then add to the food processor and continue on with the recipe. Lightly grease a 24cm tart tin with coconut oil. Place the pecans in a food processor and blitz until they’re finely chopped. Add the shredded coconut, melted coconut oil, pinch of sea salt and process again to combine. Add the dates one at a time and process until the mixture comes together. Press the crust into a 24cm tart tin using the back of a spoon. Ensure the crust is evenly pressed and spread up the sides of the tin. To make the pumpkin filling, combine all of the ingredients in a food processor and blitz to combine. Pour the pumpkin filling into the crust evenly. Place the tart in the freezer for 2-3 hours or until set. 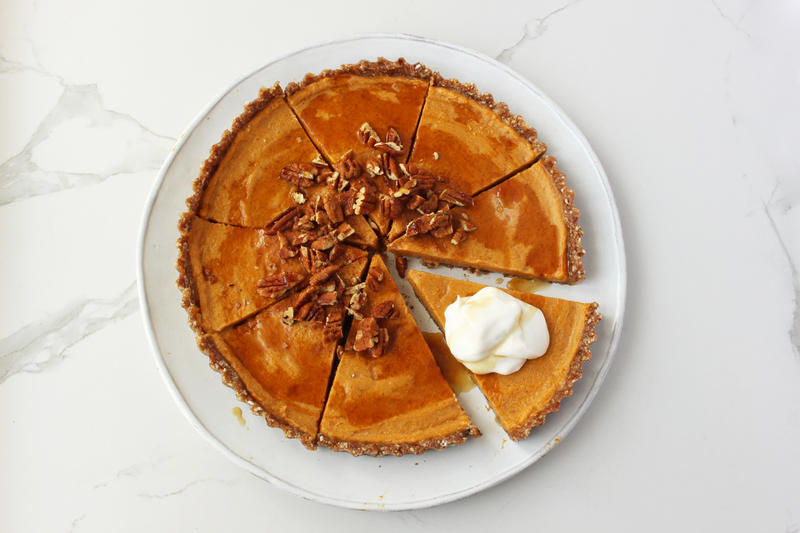 To serve, allow the pie to sit at room temperature for 10 minutes before decorating with chopped pecans. Serve with coconut yoghurt.